Available in two different configurations for specific applications, DL-type with dual illumination, and the PL-type versatile stand can be used for specimens upto 60mm thickness. Vertical movement controlled by coarse focusing large sized knobs, incorporating slip clutch mechanism for damage prevention. 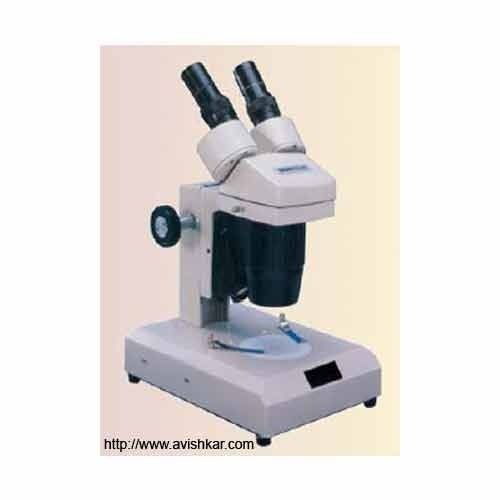 Binocular Stereoscopic observation head rotatable through 360o with locking screw. Specially corrected porro prisms provide full 3-D erect image. Interpuppiliary distance adjustable between 55mm 75mm. Dioptric correction system on both oculars. Since our Inception, we have been engaged in manufacturing and exporting a superior range of hospital equipments. Our range of products like Operation Theatre Equipments, Hospital Furniture, Hospital Hollowares, Pathology Instruments etc. are fabricated using high grade material, which are procured from certified vendors in the market. These are highly appreciated by our clients for features like durability, robust construction, Users-friendly and easy to clean. Our experts stringently test our range of the various parameters to assure its quality. Our aim is to offer quality standard equipments to our clients, which are made in accordance with international standards. Furthermore, we keep ourselves abreast with industry standards to meet the exact requirement of our clients in the best possible manner.